Twenty-five years ago, Wickham Skinner of the Harvard Business School published a landmark article called “The Productivity Paradox” (HBR 1986), pointing out that despite best intentions, large efforts, and the adoption of all sorts of improvement programs and initiatives, productivity seemed to be hardly improving. Just three years ago, Sirmon, Gove, and Hitt (2008) repeated his message in a strategic context, saying “there is an urgent need to understand how to achieve the idiosyncratic bundling and deployment choices that optimize the use of the firm’s resources.” Today both business and government are again focusing on the need to make productivity gains because it affects all organizations and the economy as a whole. Has it ever gone away? Since the 1960s, companies and government departments have tried a huge range of initiatives, sometimes collectively called alphabet soup, or TLAs (three letter acronyms), such as Total Quality Management (TQM), now updated and repackaged as “six sigma”; just-in-time (JIT); and business process reengineering (BPR). Process mapping and service blueprinting have been repackaged into vehicles such as value stream mapping, benchmarking, and “lean” management. There are many others. Most have not achieved the success rate which was being sought, and very few have delivered the hoped-for sustainable strategic outcomes. Many of these initiatives, like TQM, are conceptually sound but arguably poorly implemented. Some were just impractical. None of them have been able to dig deep enough to address the core drivers of what is needed to achieve and maintain strategic outcomes and permanent productivity gains. The reason is, they have actually been looking in the wrong place. It is like the old joke where the passerby asks the hapless car driver why he is looking for his lost keys under the street lamp when he dropped them over by the trees, and receives the answer that the light is better there. Well, it might be, but the chances of success are nil. Our comprehensive research over the past decade has shown that while people are working harder than ever on their business processes, they are not making the needed improvements, and the basic business processes are leaking ever more value like a worn sieve. Our research data quantifies that fully one third of organizational activity (33.6 percent) on average is interfacing activity noise, meaning activity that is necessary in order to prepare work and transactions to be processed in the next step in the process. These readying steps occur usually because of perfectly understandable human misunderstandings, omissions, and for the most part simple errors, which in some of the many causes behave like a virus; that is, they enter the process and cause mayhem (even more interfacing activity noise) downstream. This interfacing activity noise is actually therefore embedded, the unrealized potential amounting to about one-and-two-third days out of every five days worked, or about $25,000 per annum per person employed. Interfacing activity noise obviously is vital to any organization because making the necessary adjustments is essential for the transaction to progress unless the cause can be eliminated by managing that particular interface more intensely. In addition, these viral interfacing activities, by definition, cause delays and errors which in every instance increase response times and are likely to frustrate staff and management. They dramatically reduce customer service levels. We argue, therefore, that knowledge of interfacing activity noise, their causal factors, and the quantum of their impact is critical to business process management and therefore strategy deployment. This constitutes a potentially large productivity opportunity that will lift customer and employee satisfaction, at no cost. Every organization, large and small, suffers endemically from interfacing activity noise. The greatest surprise from our research however was that not even one of the organizations among the 117 in our research sample of well-known and respected organizations in both the public and private sectors had documented their interfacing activities (Bevington & Samson, 2012). Without this data on the quantum and causes of interfacing activity noise, organizations are obviously looking for their process opportunities in the same way as the hapless driver, where the light is best and not where the opportunities are to be found. Our research shows that this interfacing activity noise can be quickly and properly documented by the staff who do the work. Then, with their enthusiastic support, the major causal factors can be addressed. In every case this has driven performance to new heights—steep gains in customer service performance and employee satisfaction as well as achieving benchmark-bursting productivity gains. Professor Skinner in the 1980s elevated the status of the management of the operations function to become part of the business strategy mix. He was not able at that time to provide a practical approach in our view because the technological support needed to get the information to identify and improve the basic building blocks of the organization was not available. The core facts are that firstly, the devil is in the detail. Productivity is lost and limited by all the chasing around that people have to do every day in every organization because of interfacing problems between major process steps. The second core fact is good news, that when these interfacing problems are identified thoroughly and systematically, then the Pareto Principle applies in spades, and the vital 20 percent of items can be fixed to eliminate 80 percent of the effects that frustrate staff and cause value-leakage losses and dissatisfied customers, dropping both productivity and service levels. Our research reveals that the interfacing activities necessary to pass product and transactions from one step to the next largely exist below management’s radar. No organization we have encountered ever properly documents them. Yet they absorb on average one third of staff and management resource.1 This resource consists largely of the 5 Cs (checking received ‘stuff’ is complete and correct, correcting errors, chasing and completing missing information and then, critically, dealing with the consequences of any errors which, virus like, have been allowed to progress through the organization wasting time and resource as they go). Unfortunately, interfacing activity noise cannot simply be deleted. Every noise activity plays a vital role in a business process. It is needed to enable usually few erroneous transactions at every step in a process to be prepared for the next one. Simply stopping the noise interfacing activity would cripple the organization as these noncompliant transactions would not be processed. However, interfacing activity noise can be eliminated once the cause is identified and a solution applied which prevents each particular noise-generating ‘virus’ from entering the business process. In other words, the need is for managers to manage the critical process interfaces. The good news is that only a relative few causes out of the hundreds which are in a business propagate most of the noise, so once these particularly toxic causes are identified and addressed the benefit in terms of productivity, customer service, throughput, etc. will be realized. More good news is that experience demonstrates that about half of the benefit, nearly 20 percent of total resource, can be released without capital expenditure within about six months. But there are usually at least a hundred causal factors in any organization, and the viral impact is scattered through the end to end business processes. There is therefore a need for an interface activity mapping approach which enables organizations to quickly map and measure the interfaces and then accumulate the resource absorbed, classified accurately by causal factor. Today, some of the cloud-based interface mapping tools can deliver this data in about three weeks for most organizations and the staff can do it themselves. We stress that this identification and mapping must be made at the very most detailed level of shopfloor activity, which is where conventional process and value stream mapping fails to reach and why it thus usually falls short of success. So why does this interfacing activity noise exist and even keep increasing? Translating strategy into action requires organizations to define the work step sequence needed to deliver the required strategic outcomes. Unfortunately, it is impossible to foresee how the many different staff from different cultures with different skills will interpret the client needs, and staff are forever changing as they move on, are promoted, take long service leave, etc. Consequently, managers prudently insert checking steps on many interfaces to ensure everything is correct, complete, and on time. Management, understandably, also insists that the “checker” does whatever is needed to ready a transaction so that it can be processed (i.e., handed on to the next step in the business process). So the checkers, at best with some input from their team leader, will invent the activities to address these routine problems within the constraints imposed by their position and then make use of these activities when the problem recurs. Disturbingly perhaps, this means that the most junior staff design most of the interfacing steps in the process, and they do it with little or no management oversight, or understanding of the organization’s strategic priorities. There are some very persuasive reasons why organizations don’t bother to map and measure their interfacing activities. The most obvious is that the tools in common use are not up to the job. They can be used to map interfaces, but then they work best for process mapping a very limited scope in order to deliver useful improvements. To map a whole organization with conventional mapping tools typically takes many months, even years of effort, and then the critical interfacing activities are likely to be hidden in plain sight by being represented as connecting arrows in a process flow. Business and business change is moving too fast for months or years of elapsed time to be practical even if interfacing activities could be properly captured. Secondly, our research shows that the average interfacing activity absorbs less than two hours per month. “Why bother?” would be a normal manager’s response—not worth the effort! However, consider the research using the information provided by the 13,657 staff and managers in the 117 organizations in the research sample. One in 10 of the noise causal factors will have virally infected the organization. Identifying and then being able to fully address the top 10 causes in order to reap half of the 33.6 percent of total staff and management time would look very attractive to a manager who is up to his or her armpits in noise. This would be especially so when the result virtually guarantees productivity, customer service, and employee satisfaction steep gains with little if any call on capital. Interfacing activities are generally undocumented even though they pinpoint process failure. Further, mapping, measuring, and classifying them by causal factor will quickly deliver massive productivity gains and increase employee and customer satisfaction. However that is not strategic deployment. Strategic deployment requires specific goals to be achieved such as customer service, plant and equipment utilization, achievement of environmental outcomes, and the achievement of specific stakeholder deliverables, etc. That is, specific targeted goals need to be achieved. Eliyahu M. Goldratt, in his interesting work on resource management advocated the close management of bottlenecks in his theory of constraints. Experience inevitably addressed key bottlenecks only to find that the next bottleneck was then made obvious. Interface mapping has the capability to pinpoint all bottlenecks because it documents and analyzes the rework and chasing routinely conducted at each of them. It has the capability to highlight all customer service discontinuities. All that management is then required to do is to examine the interface activity mapping outcomes and set priorities to deliver the needed strategic outcomes. We have demonstrated that interfacing activity noise pinpoints noncompliance with the management principles found in the best organizations in the world. It is therefore capable of delivering dramatic productivity gains and providing the pathway to enable organizations to emulate, even surpass the best in the world. So, in concluding, what are we saying? As a minimum there is a large opportunity in organizations to make use of interface mapping. It is quick, comprehensive, properly engages the staff, and is proven in practice. It will reveal embedded capacity averaging one-and-two-thirds days in every five days worked on average, and in some organizations it will be as high as four in every five days worked. It can provide information to ‘lean’ initiatives, six sigma, quality teams, and managers alike which will enable them to deliver more benefit, more quickly, and on a wider front. It has the potential to provide the information base to enable organizations to literally raise their productivity and break through what has been seen as a paradoxical limit on working harder to achieve more. Perhaps we even have the mechanism in studying interfacing activities to support renewed research into the Resource Based View (RBV) proposed by Penrose (1959) and Wernerfelt (1984), in order to clearly establish the link between strategic dominance and resource deployment. 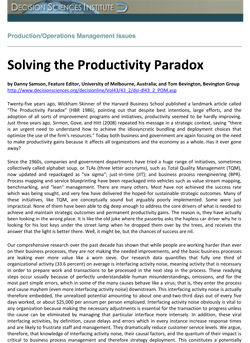 Download a PDF of this article – XeP3 Solving The Productivity Paradox. This entry was posted in Articles and tagged Lean, Restructuring, XeP3.